We often dream about the things we think about before falling asleep. If you’re worried about stress from the day at night, chances are this will be reflected in your dreams. Setting intentions before sleep helps your mind focus on something specific before you fall asleep. You can set intentions in any way that makes sense for you. For most people, one of the easiest ways to do this is by writing them down. This brings the energy of your thoughts into a physical form. When we have an idea, putting it down on paper can help you see it become real - and this makes it easier for your mind to accept it in a dream! The space you sleep in can sometimes influence your mood and feelings before bed. Learning to set up a sacred place for dreaming can help your bedroom be a great place where you enjoy sleeping! I've found it can be very helpful to journal before bed about things I want to dream about. For example, if I want to have a dream that gives me some insight on what I'm experiencing in work, I might journal my thoughts, feelings, and worries about a situation in my work. Writing down something helps set a very clear intention. Writing down your dream intentions makes your subconscious aware of what you consciously want. You may not notice right away that your dreams match up with the intentions you set before bed. It can take up to a few weeks of doing something daily before it starts to really show some incredible results. If you don't start dreaming about what you set intentions for in a few weeks - have patience! Occasionally, programming your dreams will not always seem like it is working right away. You may have dreams that are about something completely unrelated to what you want to dream about. This does not mean that you are doing anything wrong! It's important to remember in life all things are connected. Often times these "unrelated things" you are dreaming about really do have a meaning for the question you may have in life. Learning the steps for dream interpretation can help you understand your dreams fully. You may also wish to explore learning how to clear your own energy. Sometimes throughout the day we pick up a bunch of "energetic gunk" in the form of negative events and emotions from ourselves and others. This can cloud your own mind of things related to you, especially if you are an empath who is sensitive to other people's thoughts and feelings. 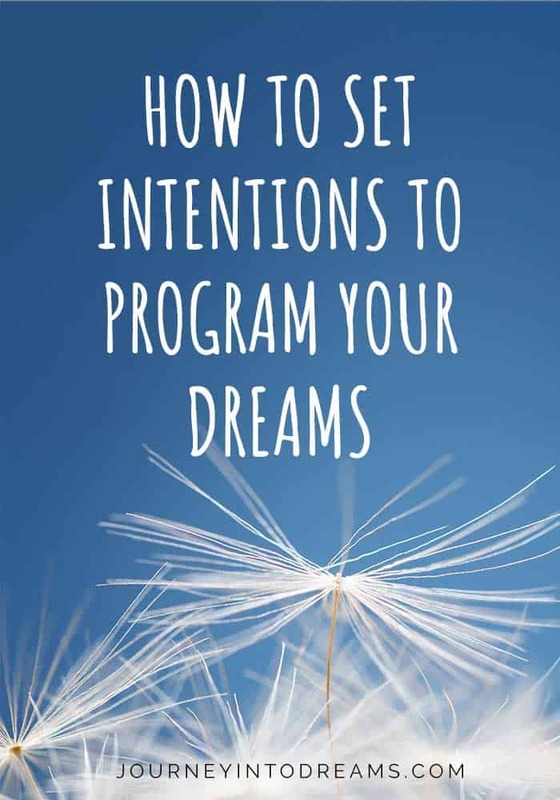 If you are looking for additional information on programming your dreams and how to set intentions for what you want to dream about, you may find these additional resources on our website helpful. Do you have any questions about how to set intentions for your dreams? Any experiences you would like to share? Tell us your thoughts on programming your dreams in the comments section below!